The perfect prospects for the post-Warriors era. Much of the year was spent debating the merits of Jahlil Okafor in contrast to those of Karl-Anthony Towns, to the point where your preference became a political and philosophical stance. Towns is almost universally regarded as the best prospect in the draft now, and it’s hard to come up with a reasonable counter. Look at the tape. What can’t he do? The Retro vs. Modern debate — crystalized in the Towns vs. Okafor conversation — has been an interesting way to frame this year’s draft, but recently it’s taken on a new kind of urgency. A paradigm shift, long in the works, occurred some time in March, and it crystallized a week ago when the Warriors overrode the championship standard and won it all. This year’s draft, seemingly more so than those in the past, has continued the dialogue that we’ve had throughout the playoffs. Namely, who rules the future, and who will dictate the way in which the game will be played? We’ve reached a point where a player’s interchangeability isn’t a slight, but the most essential quality he can have. Simply put, big men are expected to do more now than ever before. We’re well equipped to address this demand. We have factories for it. The amateur systems in place put a premium on fostering über-skilled frontcourt players. Big kids all over the world now see a platonic basketball ideal in Kevin Durant, who is himself an extreme reconfiguration of the Kevin Garnett archetype. Spacing on the court has improved, with these big men willing and able to play on the perimeter. With players like Durant, Anthony Davis, Karl-Anthony Towns, and Harry Giles coming down the pipeline, we’re building a foundation for the future of basketball. But the future is never that transparent. And while we are discovering the outer limits of what is possible in the game, it is still very much a framework that requires players to exist within its constraints. It’s not like hustling for rebounds or playing around the basket are some kind of disease. Zach Lowe wrote about this a month ago when he pondered whether post-ups had become the new market inefficiency in the NBA. Certain skills will always have value in the game’s ecosystem, and though they may no longer strictly define the play of big men, they will float on to others. They already have. As skill has become more important to to 4s and 5s, power has become more valuable in 3s and 2s. The shifting inequalities in the NBA have created a strange and wonderful region in the game’s landscape where wings function, in essence, as miniature power forwards — think Kawhi Leonard, Michael Kidd-Gilchrist, or Harrison Barnes upon entering the league. Shabazz Muhammad, a 6-foot-6 wing once lazily compared to James Harden because he is left-hand dominant, in reality probably has more in common with Zach Randolph.1 In a way, the game is inverting itself, and we’re getting closer and closer to the other side of the conical wormhole. Muhammad was one of the top 30 in the league in post-up frequency among players with at least 100 possessions, using nearly a quarter (24.1 percent) of his total attempts on post-ups. He was the only one shorter than 6-foot-8 to do so. This draft has three notable prospects of this ilk — Justise Winslow, Stanley Johnson, and Rondae Hollis-Jefferson — each with his own unique quirk to the form. In my opinion, all three deserve to be lottery picks, though it’s looking likely that only Winslow and Johnson will be. The bizarre Goldilocks porridge test of Okafor, Towns, and Kristaps Porzingis will take center stage on Thursday, but it’s this other trio that may be best equipped to take advantage of the post-Warriors NBA and make an immediate impact. One of my life’s greatest joys2 is describing Justise Winslow’s game to those unfamiliar with it. I’ve done it for three years now, and it really never gets old. He is a player who has an unlimited reservoir of energy without the recklessness that often comes with it, à la MKG, as well as the ability to absorb contact on drives like Harden and LeBron’s downhill speed and power in transition. He sets a mean screen, and can throw lobs with the best of them. Have you ever marveled at the sight of Jimmy Butler taking on the challenge of defending someone much bigger, and winning the battle simply by keeping his mind and feet two steps ahead of his opponent? That’s the kind of potential Winslow has on defense, though he might be better suited for the job than Butler, considering his diamond-dense build. Will he ever develop into anything more than an adequate shooter? Probably not, but I don’t think it matters much considering how he can affect every other aspect of the game. The earliest he’s slated to go is no. 4 to the Knicks, who have several Winslow admirers in the organization. He won’t drop past no. 8 to Detroit, though the Nuggets would be crazy to pass up on the man who could be Mike Malone’s perfect soldier at no. 7. 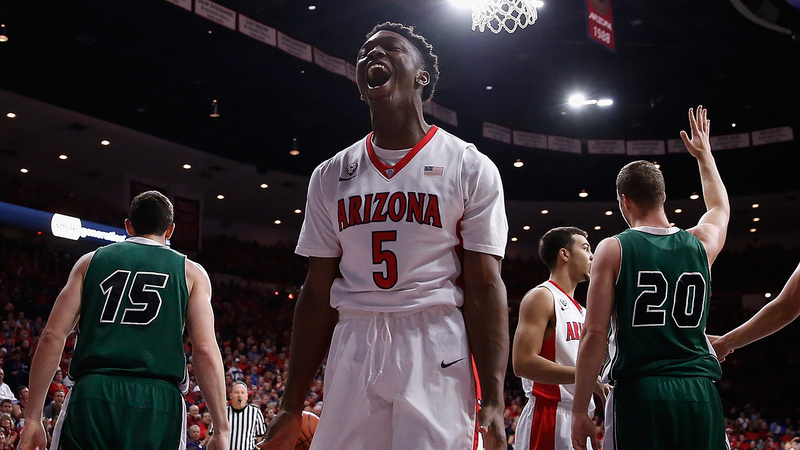 Stanley Johnson is a bear walking a tightrope. He is 6-foot-7 and weighed in heavier than Draymond Green at the NBA draft combine. Yet he is considered a 2/3 tweener rather than a 4/5 like Green. It isn’t mentioned all that often, but there was no other player quite like Metta World Peace during his eventful 15-year career. Johnson is a dead ringer in terms of bulk, strength, lateral quickness, and charmingly poor leaping ability.3 He’s the closest we’ll get to replicating World Peace, the basketball player. That’s where it gets fun. It’s not that Johnson can’t dunk. He can, and does. But his jumps are bunny hops compared to the force and speed he generates in the buildup. Johnson might be one of the most intriguing players in the draft because of where he stands on the axis of positionality. He was one of the best scorers in high school basketball at the wing, and he’s been massively successful simply throwing his body around against hapless children. But there’s a good chance he’ll get molded into something else entirely. With his power, agility, and anticipatory reflexes, he could become the kind of pick-and-roll exploder that Draymond was throughout last season. Rondae Hollis-Jefferson is slated to be drafted somewhere in the late teens or early twenties, and has Michael Kidd-Gilchrist to thank. Their similarities are uncanny: similar bodies, similar games, and similar name structure. He screams NOT A LOTTERY PICK. But those fears are misplaced, and devoid of context. Unlike MKG, RHJ never had the pressure of being a locked-in top-five selection, nor does he have the weight of being picked right after Anthony Davis. 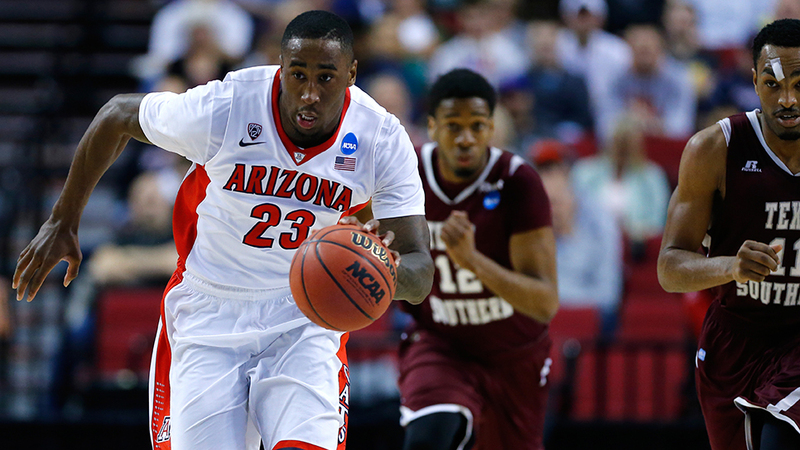 Hollis-Jefferson is the best all-around athlete in this draft, ranking in the top three in sprint and lane agility tests during this year’s combine, and placing in the top 20 in those respective categories among all NBA combine participants since 2009. 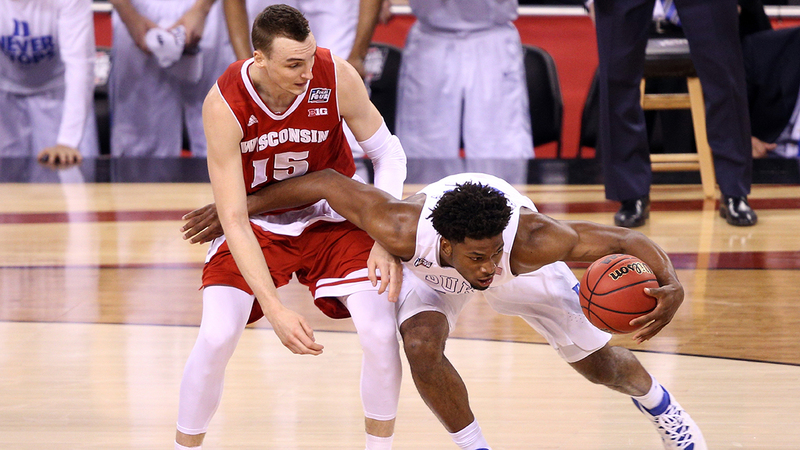 He was the best defender in the Pac-12, and routinely hounded the other team’s best player, showing out on the big stage against D’Angelo Russell in the NCAA tournament. He has an unsightly jumper, which will need a great deal of improvement before it approaches NBA level. But the last two Finals MVPs prove that there is a place in the NBA for swingmen who need time to find their games on offense, especially when you can immediately prove your worth on defense. Oh, and he’s going to be loads of fun celebrating from the bench. These players embody a type, but we’re not just looking at the formation of new positional norms in which to pigeonhole players. More than ever, a team’s context matters — there are no archaic skills, especially in the face of what we just witnessed in the NBA Finals. Roster construction has become more about fitting specific abilities around a system, rather than checking off a rigid five-position rubric. Tristan Thompson, an undersize center-type who was an almost universally lambasted draft pick at no. 4 in 2011, emerged as the second most important player on the Cavaliers for a large portion of the playoffs because of his singular ability to crash the offensive glass. His prominence was more a function of necessity4 than creativity, but he proved successful either way. Skills, trends, and positionality are all interconnected, and they all cycle through like heat in a convection oven. The future of the NBA isn’t necessarily big or small. It’s all-absorbing. It’s wide.